We stare at the list of 20 metro areas, swirl some tea leaves, shake the magic 8-ball, and come up with some odds. Now that “Dallas,” shorthand for the Dallas-Fort Worth metropolitan region, has made it into the final 20 of the Amazon HQ2 sweepstakes, the prognosticators are back at it. Reading the tea leaves, there’s at least one theme that seems like a major deterrent to Dallas’ hopes, something that’s completely out of its control. Of the remaining 20 contenders, 14 are in the Eastern Time Zone, aligning with the traditional Big American Powerhouse Cities of New York and Washington, D.C., and providing some potential symmetry with the company’s Seattle headquarters. A quarter of the remaining sites are in the vicinity of New York and D.C., although many analysts continue to give Atlanta the edge for its wider open spaces and affordability. Paddy Power, the Irish betting site, still has Dallas’ odds at 20-to-1, behind most of the other serious applicants making offerings to Amazon. That’s the disheartening news for anybody who wants to see Amazon come to Dallas, naysayers be damned. But, squint closely at the list of 20, and there are some positive signs for those people rooting for Dallas in this shameless reality show audition. 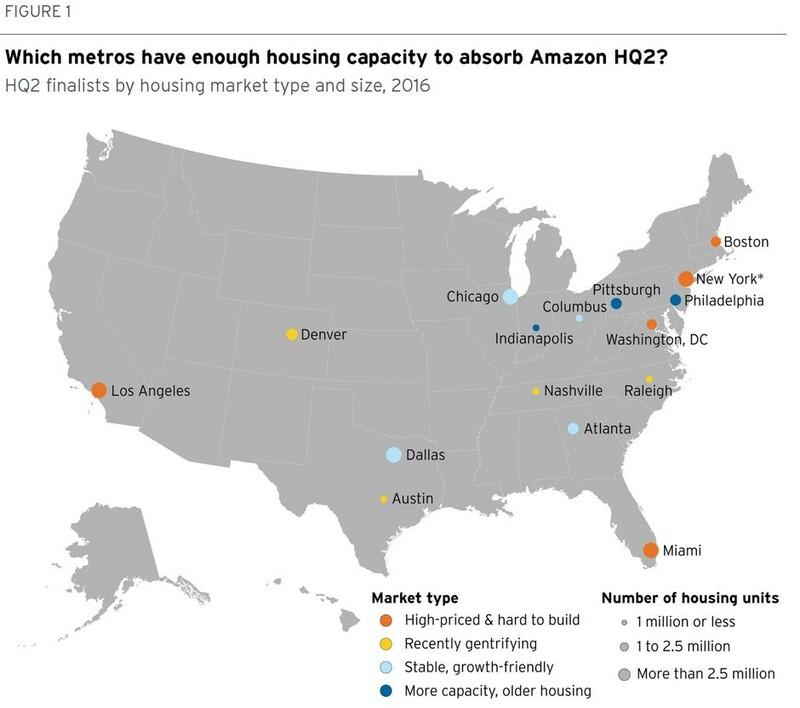 Another Brookings study notes that Dallas’ housing market may be particularly well-equipped to absorb an Amazon spike, with relatively permissive building regulations and lots of room acting as major enticements. (The 50,000 new Amazon HQ2 employees making salaries of at least $100,000 wouldn’t be bothered much by our affordable housing crisis.) Having the necessary housing capacity wouldn’t prevent any of the battles over gentrification and equity that would only be exacerbated by HQ2, but it may make the company more likely to come here in the first place. Just look at the size of the welcoming blue dot on the map! Look all these available apartments and new apartment blocks in the Dallas metro area! As for what happens next, here’s the official Amazon line from a press release: “Amazon will work with each of the candidate locations to dive deeper into their proposals, request additional information, and evaluate the feasibility of a future partnership that can accommodate the company’s hiring plans as well as benefit its employees and the local community. Amazon expects to make a decision in 2018.” So we wait.